Can I replace the PDF text in capital form but reserve that in lowercase or small letter? I want to change the PDF text that is of the same content, but some are in capital while others in lowercase. For example, how to replace "WWW.A-PDF.COM" with "A-PDF to Flipbook.com", but reserve "www.a-pdf.com"? 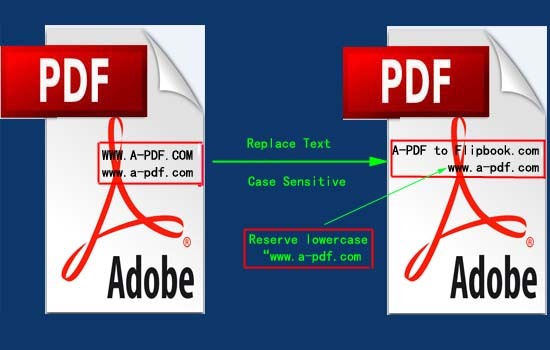 enable you to change PDF text, but also provides you with "Case Sensitive" feature that can differentiate capital and lowercase letters while modifying text content. 3. Click "Replace" or "Replace And Save as" to finish replacing. The output PDF will retain "www.a-pdf.com" which is written in small letter, but with all the capital "WWW.A-PDF.COM" changed to "A-PDF to Flipbook.com".